Every Christmas the UK’s major supermarkets try to outdo each other with high-budget seasonal TV commercials. One of this year’s ads, oddly enough, contains a fleeting moment of phonetic coaching. shows Freddie and his team of helpers transforming the empty market square [of Kingston upon Thames] into a bustling festive haven. The advert follows Freddie as he helps set up the stalls, decorate the Christmas tree and sample the delicious festive banquet. A Standard Southern British (SB) panettone, of course, would be no better in the consonants – less affrication but more aspiration – and considerably worse in the vowels. Italian has a natural vowel system, in the technical sense of occurring commonly across the world’s languages. By contrast the SB vowel system is pretty weird; traditional RP’s was even more so. We often find greater naturalness in Britain’s regional accents, and where this is true it tends to make them a better starting-point for pronouncing other languages. Flintoff’s Lancashire English certainly has the edge over SB when it comes to saying panettone, Italian style. Why don’t Morrisons advertise their panettone with someone who can actually pronounce it. Pannettawwwwwneh. Of course the producers of TV ads and the bulk of the viewing public are not phoneticians. 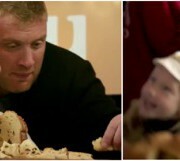 But given that an idiomatic Italian rendition of panettone immediately follows Flintoff’s, one might have expected someone to notice the similarity, during the shoot, or the edit, or the ad’s broadcast shelf-life. Apparently not. In my previous post I suggested that British speakers are no longer susceptible to feelings of phonetic inferiority strong enough to motivate RP-centric hypercorrection. Things have clearly changed since the days of “refayned” English, when TV ads rarely featured anything but RP – nowadays UK supermarkets would be rather unlikely to choose a SB celebrity to represent them. Flintoff seems comfortable in his phonetic skin, no doubt aware that his non-standard accent was probably a major factor in winning him this advertising deal. Nonetheless there still seems to be a general assumption that, when it comes to something as sophisticated as pronouncing Italian, provincials will be hindered rather than helped by their accent – an assumption strong enough to overpower the evidence of the ears. This is an excellent description of Flintoff’s performance! And, yes, his pronunciation of the word “panettone” does sound remarkably similar to a pukka Italian one! PS: Geoff, can I add your blog to my favourite links on my site? Thanks – fixed, I hope. I think that it’s a stretch to say that most Brits see the north of England as one phonetic identity. Any British person can distinguish Newcastle (and the far north) from Leeds or Manchester (and the north-central areas). It’s just that there is some overlap between Yorkshire and Lancashire, and you can’t always tell the difference easily. There is always some overlap between neighbouring dialect areas, but the north of England has several. I asked a question to Trawicks of dialectblog that prompted this entry on the subject. Thanks for reading and commenting. No doubt my wording could have been better, but most Brits do think that there is a [sic] “North of England” accent – and in a sense they’re right. Scouse/Merseyside and Geordie/Tyneside are perceived as exceptions to a generalisation; when people hear them, they tend to label them as such, and not as “Northern”. Your statement “It’s just that there is some overlap between Yorkshire and Lancashire, and you can’t always tell the difference easily” is quite true – but not common knowledge to most Brits.